From the Münchner Bücherschau: the German edition of Feeding the Doves, Taubenfuettern, on display, taking its place among my earlier Fruit Dove Press titles. Good news! The German edition of Feeding the Doves, 31 Short Stories and Haibun, Taubenfüttern, is ready for the 56th Munich Book Show 2015. I have already delivered copies of my books to the organisers of the event, which will be taking place at the Gasteig, Munich, from the 19th of November to the 6th of December 2015. Drop by if you get the chance. Pünktlich zur 56. Münchner Bücherschau (19. November – 6. Dezember 2015) erscheint die Kurzgeschichtensammlung „Taubenfüttern“ der in Athen geborenen und heute in Neusäß und in London lebenden Schriftstellerin und Dichterin Stella Pierides. Taubenfüttern ist die Übersetzung des englischen Originaltitels „Feeding the Doves“ (Fruit Dove Press, 2013), der international bestens rezensiert wurde. 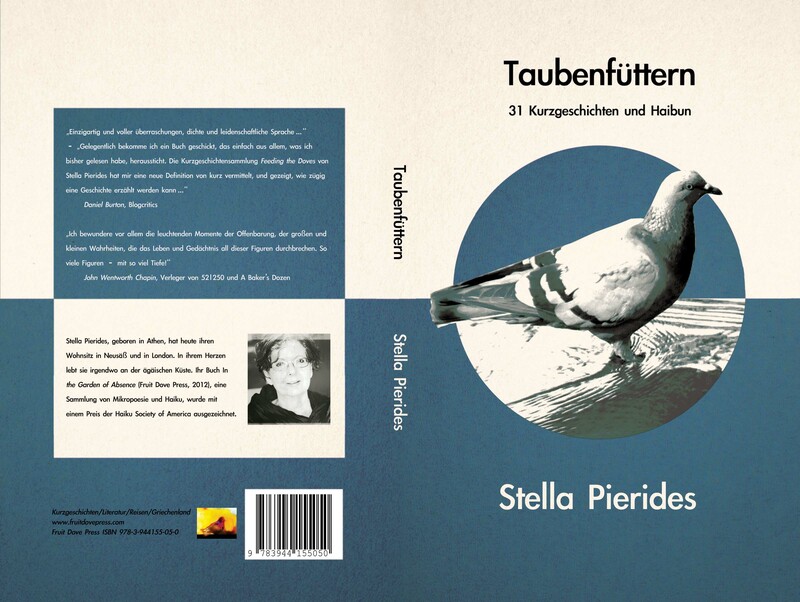 Neben Taubenfüttern und Feeding the Doves wird der Neusässer Verlag Fruit Dove Press wird mit folgenden weiteren Titeln von Stella Pierides auf der 56. Münchner Bücherschau vertreten sein: In the Garden of Absence (Mikropoesie und Haiku, 2012; ausgezeichnet mit dem Mildred Kanterman Memorial Award 2013, 3. Preis, der Haiku Society of America für 2012 erschienene Bücher) und The Heart and Its Reasons (Kurzgeschichten, 2014). Having left Greece in her youth, Stella Pierides, the author of “Feeding the Doves”, returns to the country of her birth through a collection of stories that lie at the heart of Greek identity. Read the whole review here: Attack of the Books! An article about my book of short stories “Feeding the Doves“ appeared today in the Australian newspaper “Neos Kosmos,” Australia’s leading Greek community news source. I am thrilled, as many of its readers are of Greek descent, and know, remember, or wish to know about the themes of this book. Helen Velissaris writes: “These stories manage to show universal themes entwined with the Greek psyche to give a new perspective on the Greece in the media’s headlines. Feeding the Doves: First Goodreads reviews! Good news first: Three reviews of my “Feeding the Doves” are now up on Goodreads! They can be viewed by clicking and scrolling down here (though you need to sign in to see them all). A big thank you to the readers who took the time to read and comment. The bad news? I tried configuring the Goodreads Reviews button for my website and failed! The button would show the latest reviews as they appear on the right of this page. Instead, in that space, I only managed to include the Goodreads URL! “Feeding the Doves” is now a Goodreads Giveaway! I’ve listed my book “Feeding the Doves” in Goodreads Book Giveaways! There are 12 free copies (print) available to win. Giveaway dates for entering: Aug 25-Sep 25, 2013. 1: The easy way: See the Goodreads badge on the right side of this Homepage, click to enter! 2: The slightly less convenient way: Find the book in Goodreads (here) and click the enter to win button there. Either way, Goodreads will do the rest! After the 25th of September they will notify me the list of winners and I will post the books to them! 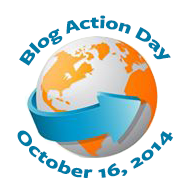 Read Daniel Burton’s review here: Attack of the Books! Mia Avramut is a Romanian- born writer, physician, researcher, and poetry editor at Connotation Press. About the Book: Greece has been in the headlines for a very long time. Recently, the headlines have been gloomy and negative, the country facing some of its most difficult years. Against this background, “Feeding the Doves” explores recurrent elements of the Greek psyche, tracing them back to challenges posed by the country’s history, culture, and environment. Available from August 2013 through Amazon.co.uk and Amazon.de.